Begin your quest through the Jungle with your map to complete tasks and answer questions. Find the monkeys and spot the parrots. Meet the lions but make sure not to disturb them, you might not make it out alive! 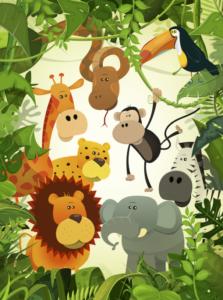 Outside school holidays (Saturday 6th April until Monday 22nd April) the Jungle Grotto is open weekends only. Tickets are valid all day on your chosen date, subject to availability. Children’s free pizza making, to create their own little masterpieces to enjoy. All equipment provided. Come along and build your very own sand castle or laze by the sand on our deck chairs. The beach is located in the Garden area. Choosing from a selection of plants and recycled products let imaginations run wild to create a personal masterpiece to take home. Tickets are valid all day on your chosen date; all equipment provided. Celebrate Father’s Day with us with our Father’s Day BBQ Weekend. The barbecue will be fired up at 10:30am and tastings will begin at 12pm (until 4pm). There will also be Farm Shop Food tastings from 11am to 3pm (Saturday Only). This is a free event, no ticket or pre-booking is required.